Community World Service Asia conducted a workshop on “Coordination and Collaboration – Civil Military Relations and Red lines” in Kohat on April 2, 2015. A total of twenty five participants, coming from twelve various organizations, which also included universities from across Pakistan, attended the sessions. The workshop’s purpose was to provide guidance to attendants regarding the dos and don’ts when it comes to dealing with the military. 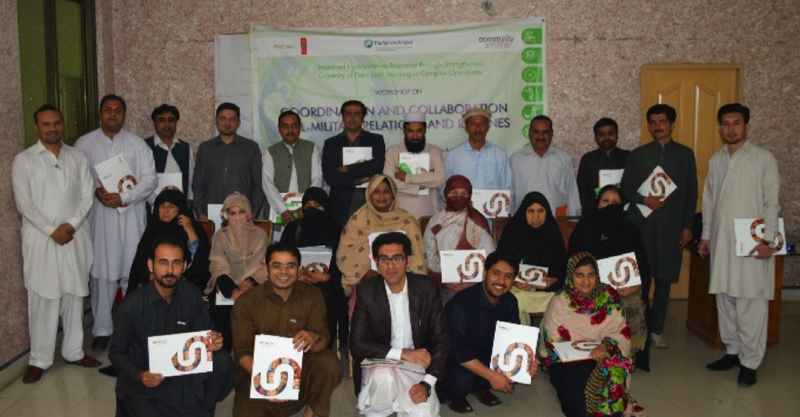 The sessions were conducted by Humanitarian Affairs Officer, Mr Haseeb Saeed from UN OCHA, while co-facilitation was provided by Community World Service Asia representatives, Muhammad Sufyan and Sultan Haider. The workshop’s purpose was to enhance the relations between the two parties, to reap better results, so that the beneficiaries can ultimately maximize their advantages at the receiving end. Mr Saeed encouraged all participants to highlight main obstacles that are faced by their organizations when it comes to interacting with the military. The problems put forward through a group activity varied from registering families of IDPs, lengthy processes of obtaining a No Objection Certificate (NOC), lack of coordination, security barriers, unnecessary and excessive interference without jurisdiction, entry to security sensitive regions as well as the unpleasant attitudes of military personnel. All issues pointed towards the hardships faced by NGOs in getting through to their target beneficiaries. The workshop progressed in a categorical manner, by first disseminating information regarding involved actors and relevant principles amongst the listeners, moving further to the more complicated aspects, for their ease of understanding since this topic was comparatively new for the target audience. Terminologies that were previously unheard of for a majority of the attendants, such as the Humanitarian Country Team (HTC) and the Humanitarian Coordinator (HC) were introduced, along with the process that goes on behind the curtains for the creation of policies and provision of facilitation. In order to instigate an alternative perspective in the mind, activities such as asking participants to act like military officials for the duration of the workshop, were used. Examples of very real and relevant impediments, with specific focus on scenarios where immediate aid is obligatory, such as both manmade and natural disasters, were discussed over the course of the workshop. Instances of wars, floods, earthquakes and epidemics were covered, where in each case the participants were enlightened about formulating clusters and working groups to avoid delays and optimize their outreach. Participants admitted to having gained both new knowledge and polishing their existing foundations for the development of better tactics to manage military presence. Discussing various levels of coordination from strategic, operational and field based points of view allowed participants to understand the importance of utilizing advocacy as the best tool. Unfortunately, female participants, with the exception of a numbered few, were unable to vigorously partake in the workshop, due to lack of knowledge and experience with the topic. Deciphering amongst key players involved in military activity, such as the NDMA, through a group exercise conducted by Mr Sufyan was popular amongst the males, however, the females could not provide their input actively. As a result, the workshop can be declared as no less than successful in getting across its message. Discussing the necessary limitations established by the military, all the while providing the participants with several methods to overcome these challenges with minimal wastage of energy and resources was ensured. The workshop accomplished its goal of defining the red lines for the civil society, to achieve the desired results within those lines is now up to the participants.